Nefertiti (c. 1370 BCE - c. 1336 BCE) was an Egyptian queen, the chief wife of Pharaoh Amenhotep IV, or Akhenaten. She is best known for her appearance in Egyptian art, especially the famous bust discovered in 1912 at Amarna, along with her role in the religious revolution centering on monotheistic worship of the sun disk Aten. The name Nefertiti has been translated as "The Beautiful One Is Come." Appropriately, Nefertiti is known for her great beauty. She likely ruled Egypt after the death of Akhenaten. Nefertiti's origins are debated by archaeologists and historians. She may have been a foreign princess from an area in what became northern Iraq. She may have been from Egypt, the daughter of the previous Pharaoh, Amenhotep III, and his chief wife, Queen Tiy. In this case, either Akhenaten (Amenhotep IV) was not the son of Amenhotep III, or Nefertiti married (as was a custom in Egypt) her brother or half-brother. There's some evidence which can be interpreted as showing that Nefertiti had an Egyptian woman as her wet nurse or governess. This would indicate that she was Egyptian herself, or had come as a foreign princess to Egypt in early childhood. Her name is Egyptian, and that would also point to either an Egyptian birth or the renaming of a foreign princess in early childhood. Records show that Nefertiti grew up at the royal palace at Thebes. Some evidence suggests that she may have been the daughter of Ay, Pharoah Amenhotep III's vizier, who was a brother of Queen Tiy and who became pharaoh after Tutankhamen. It seems certain that she was brought up in the cult of the sun god, Aten. Nefertiti was engaged to marry the Pharoah's son, Amenhotep IV, by the time she was eleven years old. Nefertiti was the chief wife (queen) of the Egyptian Pharaoh Amenhotep IV, who took the name Akhenaten when he led a religious revolution that put the sun god Aten at the center of religious worship. Art from the time shows a close family relationship, with Nefertiti, Akhenaten, and their six daughters depicted more naturalistically, individualistically, and informally than in other eras. Images of Nefertiti also depict her taking an active role in the Aten cult. The royal apartments were built on an especially grand scale: the king’s bedroom, for example, measured nearly 8 metres by 5 [26 feet by 16.5], and this excludes a raised recess to house the royal bed. The floor in the great hall of the king’s palace was painted to represent a pool in the marshes and that in the palace next door a pool with plants and water birds. The entire ceiling of the great hall was patterned with flying vultures; that of the king’s bedroom with a row of vultures. The ceilings of many rooms in the palace were painted with spirals and interweaving designs, combined with naturalistic forms such as flying birds. Before the tenth year of his reign, Pharoah Amenhotep IV took the unusual step of changing his name along with the religious practices of Egypt. Under his new name, Akhenaten, he established a new cult of Aten and abolished the current religious practices. This had the effect of undermining the wealth and power of the cult of Amum, consolidating power under Akhenaten, and, not surprisingly, gained the pharaoh many enemies. As part of his religious revolution, Akhenaten decided to leave Thebes and move to a virgin site that would be dedicated to his new cult. The new city was located in Middle Egypt, and called Akhetaten, `Horizon of Aten’. It was laid out parallel to the river, its boundaries marked by stelae carved into the cliffs ringing the site....Each day, Akhenaten and Nefertiti processed in their chariots from one end of the city to the other, mirroring the journey of the sun across the sky. In this, as in many other aspects of their lives that have come to us through art and texts, Akhenaten and Nefertiti were seen, or at least saw themselves, as deities in their own right. It was only through them that the Aten could be worshipped: they were both priests and gods. Tutankhamen's mother is noted in records as a woman named Kiya. She may have been a lesser wife of Akhenaten. Her hair was styled in the Nubian fashion, perhaps indicating her origin. Some images (a drawing, a tomb scene) point to the pharaoh mourning her death in childbirth. Images of Kiya were, at some later time, destroyed. DNA evidence has surfaced a new theory about Nefertiti's relationship to Tutankhamen ("King Tut"). This evidence suggests that she was the mother of Tutankhamen and a first cousin of Akhenaten. An earlier theory about the DNA evidence proposed that Tutankhamen was the son of Akhenaten and his (unnamed) sister, rather than of Nefertiti and Akhenaten. After 12 years of reigning as the beloved wife the pharaoh, Nefertiti seems to disappear from recorded history. There are multiple theories about what may have happened; none, however, has been proven. She may, of course, have died at that time, or she may have rejected her husband's new religion. She may also, according to some researchers, have changed her name to Smenkhkare and continued to lead her people until Tutankhamun, her stepson, could take over the throne. Nefertiti's disappearance coincides with the disappearance of three of her daughters and the death of one. While Nefertiti could simply have died in that year, she is not buried in the royal tomb. Her body has never been discovered, though some believe that she may have been identified as a royal mummy in the Valley of the Kings. 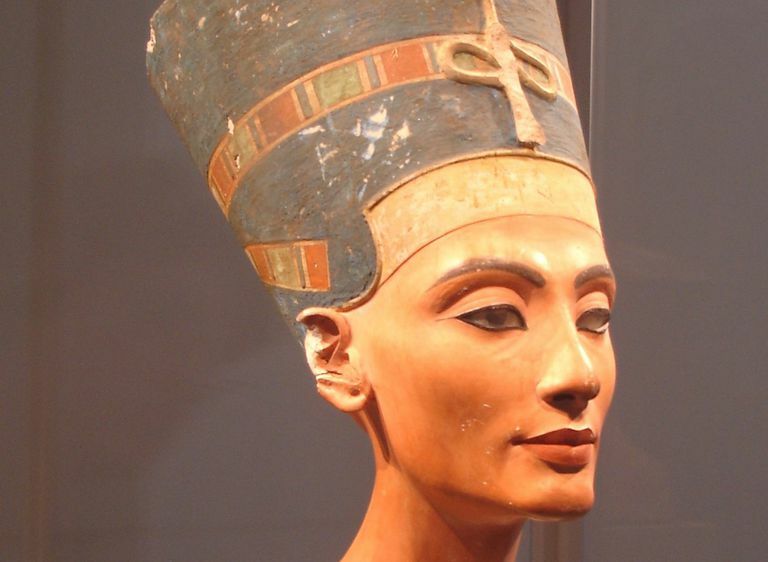 While Nefertiti herself has had little or no personal impact since the end of ancient Egyptian civilization, her story and fate have generated significant research and dispute in recent years. As more evidence is turned up, researchers have presented and responded to a range of theories about the civilization in which she lived, her life, and her fate. Hawass, Z. The Golden King: The World of Tutankhamun. (National Geographic, 2004). Mark, Joshua J. " Nefertiti ." Ancient History Encyclopedia. Ancient History Encyclopedia, 14 Apr 2014. Web. 25 Apr 2019. Powell, Alvin. "A different take on Tut." The Harvard Gazette, Harvard University, February 11, 2013. Rose, Mark. "Where's Nefertiti?" Archaeology Magazine, September 16, 2004.